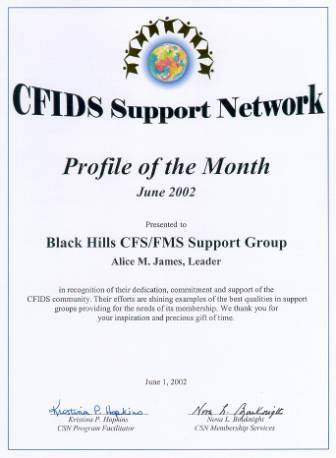 The Black Hills CFS/FMS Support Group was established in January 1995 with a common bond of sharing concerns, feelings and experiences. This very diverse group of 600 (on their mailing list), shares their many talents in public speaking, designing business cards, teaching a CFS/FMS self-help class, offering notary services and reconditioning old computers to loan them to support group members – just to name a few. This group has a unique goal – to support the whole family. Family members and friends are always welcomed and encouraged to attend support group meetings to share their feelings and concerns along with the patients. After all, CFIDS is an illness which affects the entire family. Meetings are held at the regional hospital with an average attendance of 20 members. Using the many talents of group members, they have created their own Web site at http://bh.cfs-fms.tripod.com/. Here you can find information on Fibromyalgia, children and youth, a newsletter archive, disability information and much more. Their group discussions are designed to foster positive attitudes and are directed toward solutions. They share their problems, but do not dwell on them. They provide hope. You will often hear people saying at this support group, “Finally, someone understands how I feel, I’m not alone.” Congratulations to this group for finding the solution as to how a group can succeed and thrive!